Three individuals who have dedicated their lives to waterfowl conservation in North America were called together to talk about the complex issues surrounding the continent’s waterfowl. 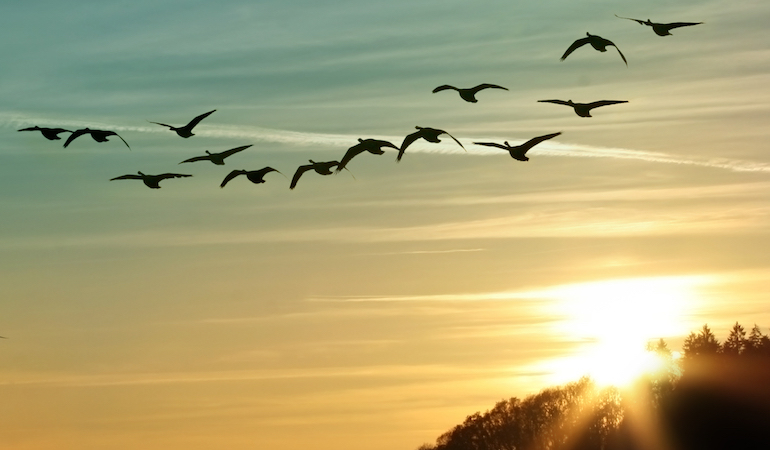 With more than 75 years combined experience brought to the table, these experts in their field share a conversation that demands our attention on how the past and present affect the future of waterfowl populations and conservation. It’s often necessary to take a look back to fully see and understand what history might hold in store for the future. Such is the case with waterfowl conservation. “Everyone should know about the Migratory Bird Treaty Act (MBTA) and the signing thereof in 1916,” says Dr. Tom Moorman, chief scientist for Ducks Unlimited (DU), the well-known non-profit organization dedicated to wetland and waterfowl conservation. Dr. Moorman describes the MBTA as “probably the most significant milestone” in North American waterfowl conservation because it protected migratory birds from market hunting practices, which were decimating waterfowl populations at the time. The original Migratory Bird Treaty was signed and enacted in 1916 between the United States and Great Britain (Canada) and was officially implemented in the U.S. with the Migratory Bird Treaty Act of 1918, a little more than 100 years ago. After that landmark legislation, Dr. Moorman points out, similar steps forward in waterfowl conservation included the Migratory Bird Hunting and Conservation Stamp Act, or the Duck Stamp Act, in 1934. This provided a continuous source of funds for waterfowl habitat. 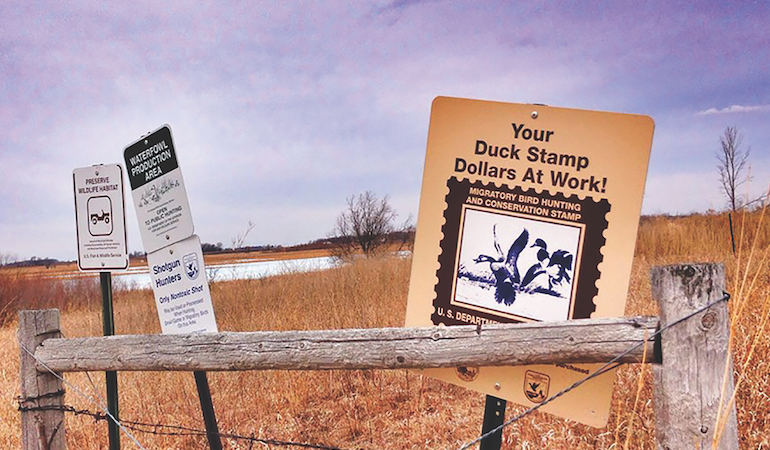 As of July 2018, about 6 million acres have been acquired using Federal Duck Stamp revenues, according to the U.S. Fish and Wildlife Service (USFWS). Another key piece of legislation, and one that also addresses funding, is the Federal Aid in Wildlife Restoration Act of 1937, most often called the Pittman-Robertson (P-R) Act. It helps fund conservation efforts through an excise tax on certain hunting and fishing gear. This focus on ensuring funding for waterfowl habitat, projects and scientific research programs continues to this day. 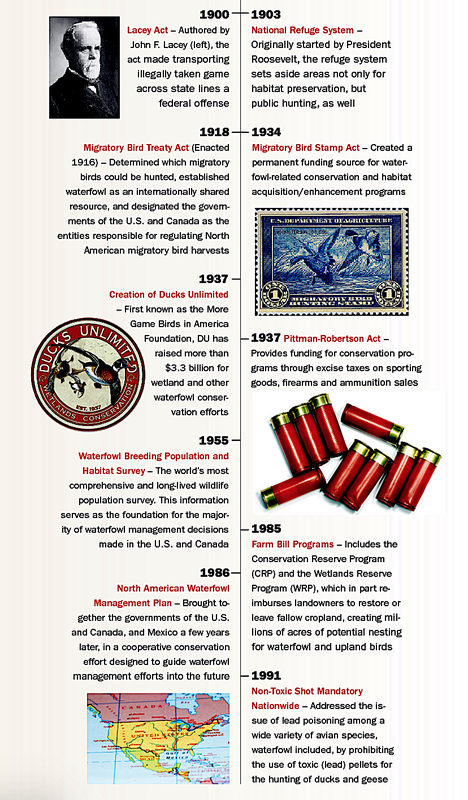 The same year the Pittman-Robertson Act was approved, another key moment in waterfowl conservation took place: the founding of Ducks Unlimited. The Waterfowl Breeding Habitat and Population Survey, first undertaken in 1955, is now the world’s most comprehensive and longest-running wildlife population survey. Each year, biologists from the USFWS, the CWS and state and provincial agencies conduct physical counts of waterfowl populations by air and ground methods across thousands of miles in the northern U.S. and Canada. According to Dr. Moorman, this has permitted the science behind waterfowl management to grow in leaps and bounds over the years. He also cites the Clean Water Act of 1972 and the North American Waterfowl Management Plan (NAWMP) in 1986 as major landmarks for moving waterfowl conservation forward. The Clean Water Act, designed to guard against water pollution, also provided protections for wetland areas. And Dr. Moorman says he believes the NAWMP might be “the most significant advancement in recent times,” in terms of conserving and managing waterfowl populations, and one that will continue to influence conservation decisions going forward. Established by the U.S. and Canada, and expanded in 1994 to include Mexico, the NAWMP involves planning and coordination at the international level and implementation of projects at the regional level to help ensure the safety and future of migratory bird populations. The NAWMP has included a number of joint ventures over the years designed to positively affect certain regional areas, as well as a few certain species of waterfowl. According to Craig LeSchack, a former waterfowl/wetland biologist for Florida’s FWC and currently serving as DU’s director of conservation programs, one of the biggest changes in the years following the NAWMP has been accounting for “the human dimension” in waterfowl management. In addition to basing management decisions on scientific data on waterfowl populations and habitat, managers are also considering in their choices the expectations and desires of hunters, bird watchers and the general public, which he says wasn’t the case 20 years ago. Wiley backs up that sentiment. “We’re going through some pretty significant changes [today] in terms of how wetland conservation has benefits far beyond simply producing ducks,”Wiley says. “Major benefits, such as water quality, water conservation and flood protection — all these things matter to a broader segment of the public and go beyond [just] the hunting community. But what is modern life without its challenges? Understandably, waterfowl conservation and management are facing several tests. At the top of the list is habitat change, be at it the hands of agriculture or the ever-growing specter of urban sprawl. This is particularly important in the critical Prairie Pothole Region, which by many estimates supports more than half of North America’s migratory waterfowl. 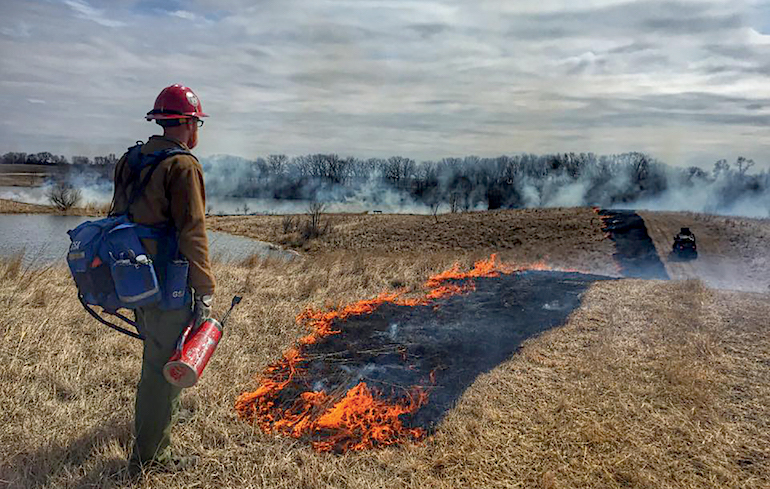 According to Environmental Protection Agency (EPA) estimates, only about 40 to 50 percent of the region’s original prairie pothole wetlands remain undrained today. With agriculture in particular, it seems to be about striking a balance. Also at the forefront in the minds of today’s waterfowl managers is what Wiley refers to as “a clear and present decline in hunting overall.” He says waterfowlers are slightly more resilient to this decline, but he is still quite concerned, particularly given that the average hunter is 50 years old and male. The declining hunting population also translates to a corresponding decrease in funding. A good chunk of conservation funding comes from those excise taxes on certain sporting goods and on license sales. With fewer hunters, then, comes less funds for conservation. Is there a solution to this ever-increasing downward spiral in hunter numbers? Confronting the issue, Wiley suggests, is the first step. And, he adds, with the loss of more than 2 million hunters in the past five years, according to USFWS surveys, that issue is clear. So, what does the future hold? All wildlife managers spend a large portion of their time looking beyond the “now” to prepare themselves for the difficulties sure to come tomorrow. Dr. Moorman points to climate change as one of the biggest unknowns going forward long term. Some models call for warmer and wetter prairies, he says, but that’s certainly not guaranteed. And even if those predictions were to hold up, the impacts would be unclear. More water could be good for waterfowl production, he suggests, but it might also affect hunters in other ways. For example, he says, increasingly milder winters might hold ducks farther north longer during the hunting season; perhaps they won’t leave at all if cold weather isn’t pushing them south. In the end, Dr. Moorman says, everyone will simply have to “continue to have good science and be aware...” and “...adapt and adjust our management styles” to meet whatever conditions arise.